Modern Tents come in all sorts of shapes and styles. Two main factors that are kept in mind while designing a tent is the altitude/weather conditions for use and the people it can accommodate. Tents are also made for different lifestyles, ranging from rough and tough use to more relaxed glamping. 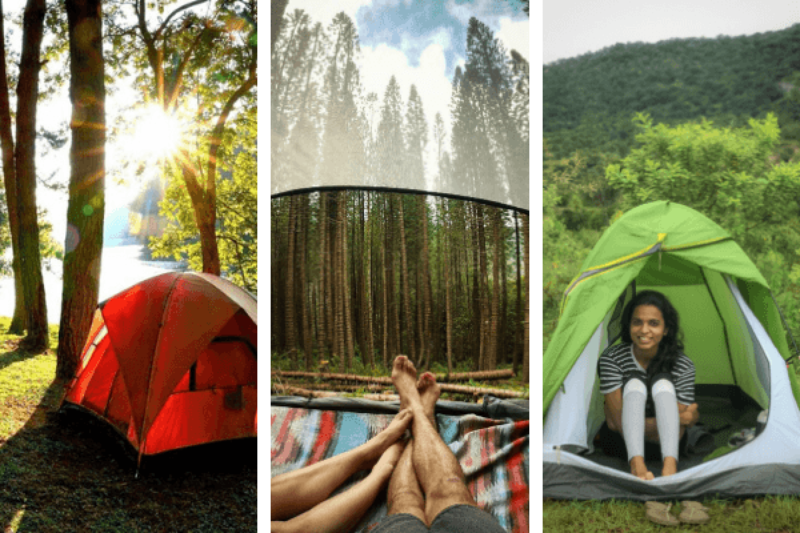 Here's 5 Major types of tents by shape, they come in different sizes and weather options. Dome Tent Dome tents are the most popular tent design because of its functionality and its price. Dome tents are sturdy and can be used at all most all locations from the mountains of south India to mountains of Himalayas. These tents comprise two flexible poles being formed into a semi-circle shape. One or two poles going across the roof gives it a square dome. This depends on the manufacturer and their design approach. The walls of a dome tent are more vertical giving it space for people to sit comfortably. The main drawback of this style of tent is that that stability reduces as the size goes up in heavy winds. This type of tent is the preferred choice for trekkers due to its light weight. Geodesic and Semi-Geodesic Tents These are by far the most technical tents available in the market. A geodesic is a mathematical term were lines intersect to form triangles. This tent uses multiple triangles across its shape, gives it extreme stability in rough weather conditions. They can be expensive due to its technical nature. These tents are also made with world-class fabrics which add to the comfort as well as cost. They are the preferred choice for trekking companies since they have to be durable against strong winds and last for a long period. Geodesic tents are the preferred choice for people climbing Everest. Tunnel tents Manufacturers started making tunnel-shaped tents which are aimed at leisure activities. These tents provide more room. Casual campers were looking for something that would keep their family comfortable. These tents use flexible tents poles in a tunnel shape. Additional tent poles go across the body which gives it support. Sections can be added to make more space, giving an extra room for another person to sleep in. Tunnel tents are the preferred choice for casual camping but can be very large and heavy. Khyam System Tents The Khyam system uses a combination of dome and semi-geodesic shape or either. The primary advantage of this type of tent is that the poles are already fixed to the main body of the tent. The poles can be folded in half and locked into place when straightened. This makes them easy to set up. This type of tent is the preferred choice for bikers or long drives. These can be quite heavy and cannot be carried while trekking. Roof Top Tents This is the most expensive type of tent and definitely not the most affordable. These tents come in a soft shell and hard shell style. Sold at a very high price point, this style of tent is not for everyone but the convenience of a fixed camping spot could be a huge plus point. If you're keen on exploring these tents you can check out Zen Mountain Gear and if you'd like to find a place to use it, then Camp Monk is the place to be at. How to pitch a tent like a boss!